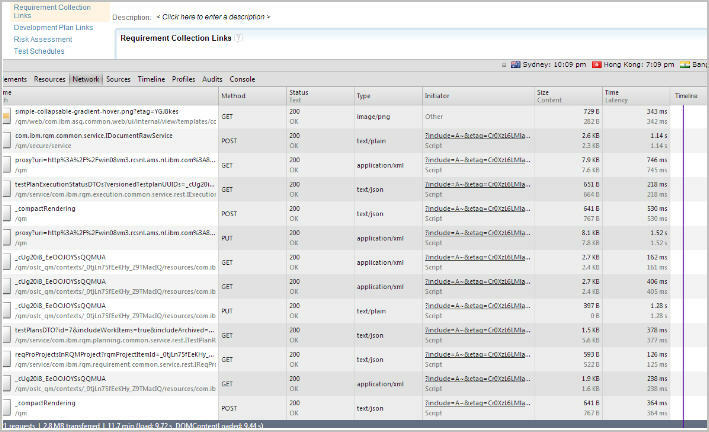 This topic provides a general strategy for debugging Open Services for Lifecycle Collaboration (OSLC) based integrations with IBM Rational DOORS. Can the DOORS Web Access (DWA) server resolve the hostnames of the Jazz server (in an enterprise topology, for instance, if IBM Rational Quality Manager (RQM) and Jazz Team Server (JTS) have different hostnames), can it resolve all of the Jazz topology names? Check this with nslookup . Then check in the other direction, can the Jazz server find DWA? Can the DWA servers ping the Jazz servers and vice versa? Are the timestamps between the servers synchronized? Timestamps are part of the oAuth dance and having a mismatch can break it. Is a Pop Up Blocker blocking stuff? Is a network Proxy preventing access? Is browser security impacting? If it is seeing internal servers as ‘Internet’, try them as trusted or intranet. Microsoft Internet Explorer MUST work for accessing any application you wish to link to DOORS. If it does not work in Internet Explorer, it is unlikely it will work in DOORS. Known issues are listed in the Integration Troubleshooting section of the Deployment wiki. In particular in versions prior to 9.5.1, ensure the DOORS Database and DWA have been configured to use the exact same protocol, port, and hostname. See technote Technote 1612615 for more details. Is the issue specific to a particular DOORS module, view, object or a particular artifact on the Jazz side? Are there non alpha numeric characters that might be breaking it? If this is the case, it is likely a defect and should be addressed by Rational Support or logged on jazz.net. The DWA festival logging is very good in particular for OSLC requests. Take a look at them for any errors or messages - DWA Install Dir/server/festival/logs. It is possible to activate more logging by renaming DWA Install Dir/server/festival/config/festival-log4j.xml.support to festival-log4j.xml and restarting DWA. Broker logging can be activated by renaming DWA Install Dir/broker/conf/log4j.properties.support to log4j.properties and restarting DWA. Consider also the Jazz application logs. ccm.log for Rational Team Concert (RTC), qm.log for RQM, rm.log for Rational Requirements Composer (RRC) or DOORS Next Generation (NG), dm.log for Design Manager. First consider where the problem is see: is it in a Jazz application or in DOORS Web Access (DWA) or in DOORS 9 client? If it starts in a DOORS 9 client, is it reproducible in DOORS Web Access? 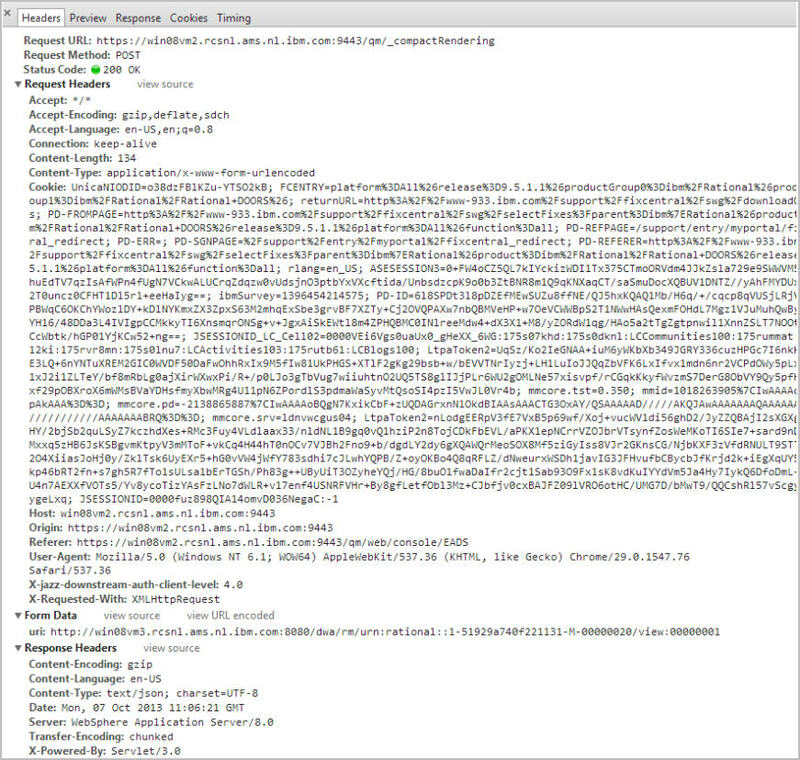 Moving to a web based application simplifies debugging. http tracing tools such as Firebug (an addon for Mozilla Firefox), Internet Explorer Developer Tools (from Internet Explorer 9 onwards, as we need network tracing) or Google Chrome Developer Tools can help. Regardless of the browser or tool, what we are mostly interested in is the Network tracing. At their most basic, OSLC integrations are sending and receiving HTTP GET, PUT, or POST requests. If something is failing, it is likely one of those we want to trace. Is there an error code in there we are not seeing in the logs? Is there something different in a request which works and one which fails? Some screenshots – from Chrome. A Test Plan creates a Requirements Collection Link to a view in DOORS. Then the Test Plan is saved. Here we see GET, PUT, POST operations. In this instance, they all worked, so all give a 200. If we want to look in more detail, we double click on the request of interest. For instance, for the final POST – this was a Save of the Test Plan. That operation writes to the View in DOORS so that DOORS is also aware that the view is linked to a Test Plan. This is a bit trickier. There is little in the way of out of the box logging and for the most part, DWA will not be used so its logging does not help. From 9.5.0.1 however, it is possible to use Fiddler which works like Firebug and Developer Tools. Install and start Fiddler – get it from: http://fiddler2.com/. 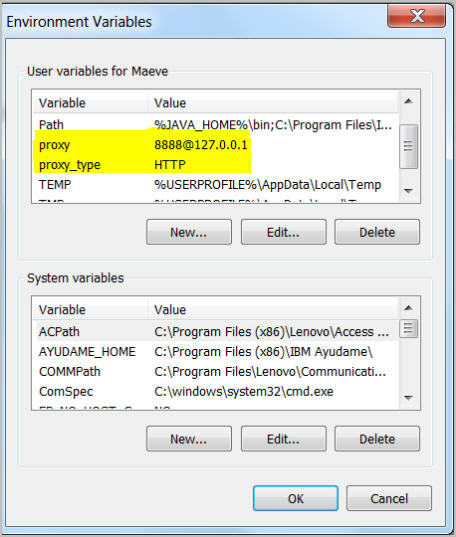 If either application is using https (this is the default for Jazz applications and recommended for DWA), under Tools-Fiddler Options-HTTPS, check Decrypt HTTPS traffic. Start the DOORS Client. Now all OSLC requests DOORS makes will go through the proxy defined here and can be seen in Fiddler which can help track down the particular one which is failing in the same manner as Firebug. Remember to delete the environment variables when you are done or DOORS will not function correctly if Fiddler is not started.